PLYMOUTH - With spring weather starting to show, Clifford Jones of Cliff’s Automotive said many people this time of year will start to hear noises coming from their vehicles, as they will be driving with the windows open for the first time since the temperatures dropped last year. 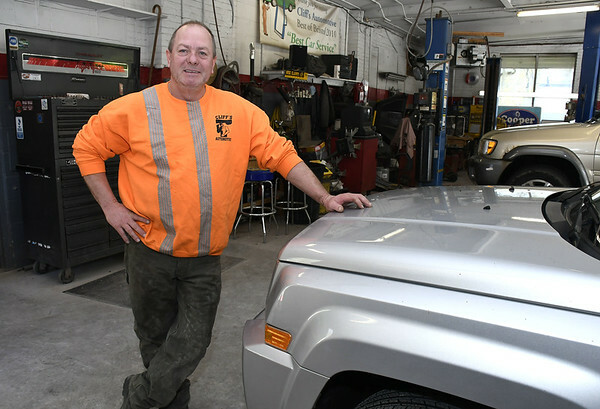 “If you’re hearing a noise, get it checked out,” said Jones, whose automotive shop is located at 410 Main St.
Jones opened his automotive garage in Terryville in 2008 after spending 11 years at a location in Farmington. Many of his regular customers followed him to his new location, liking his work. “Some of my customers have been with me for 20 years,” Jones said. Jones said he is best known for doing fair and honest work. “You don’t find that in the automotive industry,” he said. The work Jones does includes oil changes, batteries, starters and alternators, belts and hose repair, carburetor repair, check engine light repair and diagnosis, tune ups, engine performance checks, fuel injection repair, fuel pump repair, computer diagnostics, air conditioning service and repair, heater repair, brake repair, suspension and steering, shocks and struts, cooling system service, wheel alignment, mufflers and new tires. Jones has an A+ grade with the Better Business Bureau and has earned the Automotive Seal of Excellence. For more information about Cliff’s Automotive, visit their website at cliffsautomotivect.com. Posted in The Bristol Press, General Business, on Tuesday, 26 March 2019 19:51. Updated: Tuesday, 26 March 2019 19:54.